﻿ University of Florida President Dr. J. Wayne Reitz, Judge Harold Medina, and an unidentified man on stage in the Florida Gym. University of Florida President Dr. J. Wayne Reitz, Judge Harold Medina, and an unidentified man on stage in the Florida Gym. 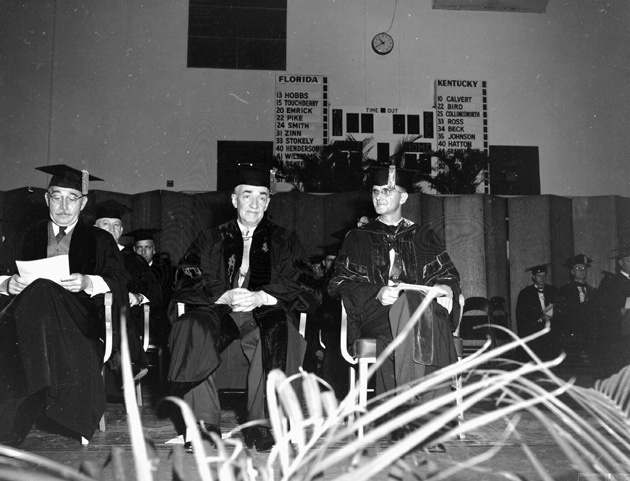 University of Florida President J. Wayne Reitz, Judge Haold R. Medina, and an unidentified man on stage in the Florida Gym during Dr. Reitz's inauguration as president of the University of Florida. Photograph 4384 from the University Archives Photograph Collection.